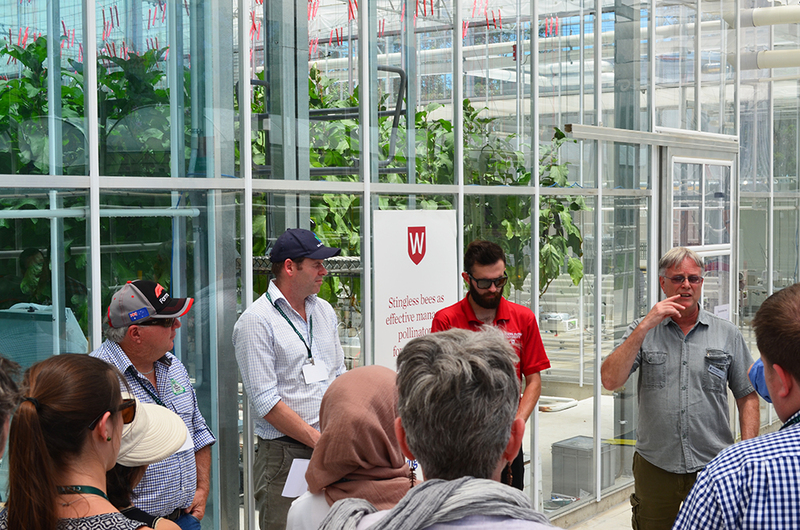 Western Sydney University’s Hawkesbury campus hosted a valuable field tour as the ANZ Smart Farms and Agtech Forum: Future of Farming with Precision Agriculture, Big Data and Robotics Conference commenced on December 4th and 5th at Sydney’s International Convention Centre. Guests toured the new agtech installations at the University’s Hawkesbury campus, including the National Vegetable Protected Cropping Centre (opens in a new window), climate-controlled glasshouses and the newly-installed Internet Of Things sensor system, The Yield, that offers new insights into best-practice farm management and agricultural teaching and learning. The University was selected as the location for the conference field tour as the first University to implement The Yield (opens in a new window) on its farm. The Yield is a system of sensors, nodes and cloud computing hardware and software that uses Artificial Intelligence and Machine Learning. It captures field data such as temperature, humidity and rainfall and processes that data centrally to help farmers and scientists produce better yield forecasts and more precisely monitor the progress of their crops through mobile phone dashboards. The National Vegetable Protected Cropping Centre is an 1800 square metre glasshouse designed with the world’s best available glasshouse systems and computer controls to optimise the way food crops are grown, with a small footprint relative to the potential yield and resource usage. "Agriculture and horticulture today are fast becoming driven by the same advances in data and cloud computing systems that have transformed manufacturing, retail and countless other industries", explains Dr Roger Attwater, Senior Manager, Environmental Sustainability. "The emerging innovations in agricultural, horticultural and environmental sustainability are perfect learning environments for students and for industry. The systems and facilities that we install to run a better farm also provide compelling learning environments for students interested in design, entrepreneurship, computing or business to experience how technology is shaping food production and consumption", Roger explains. Western Sydney University is deeply-invested in agricultural sustainability excellence. With a recent pledge by the Federal Labor Government to invest a further $20 million into agtech-driven glasshouse production at Hawkesbury and the signing of Memoranda of Understanding with 13 research institutions in India to supercharge protected cropping exchanges, the Hawkesbury Campus is shaping the University’s vision to draw on the best available technologies for education, learning, training and research in next-generation farming and food production. The ANZ and Smart Farms Forum ran until Wednesday 6th December and featured a lineup of the leading experts in agricultural technologies, innovation and policy research in Australia. Taking a positive step in engaging and empowering millennials and their communities with the issues of a changing climate, Western Sydney University has launched a new online community, Earth IQ. Through multimedia storytelling, expert commentary and activations, Earth IQ is a way of inspiring a generation to embrace more mindful and sustainable living - one carbon footprint at a time.